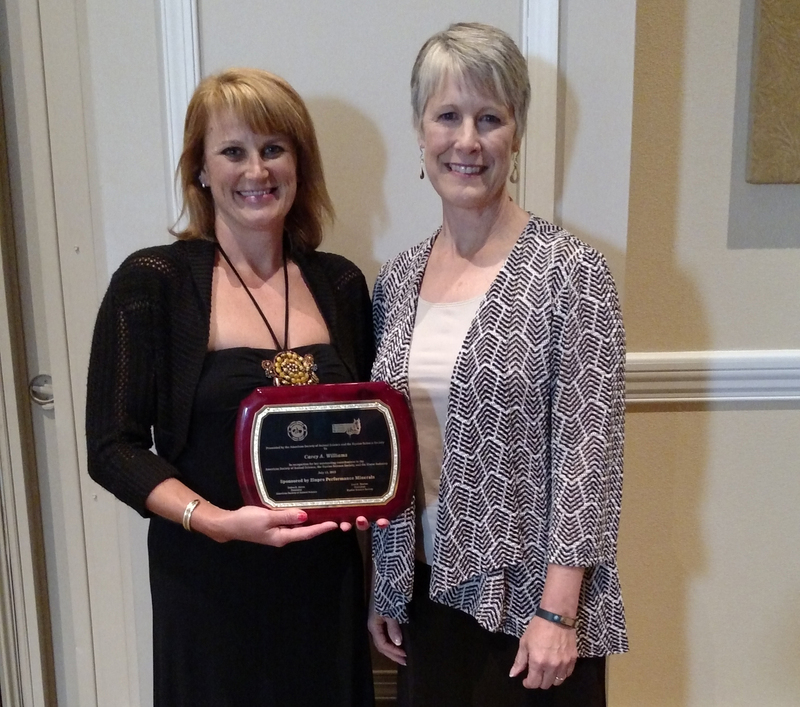 ORLANDO, FL (July 14, 2015) – Dr. Carey Williams, Associate Director of Extension at the Equine Science Center at Rutgers University, and associate professor in the Department of Animal Sciences at the School of Environmental and Biological Sciences, received the 2015 American Society of Animal Science and Equine Science Society’s Equine Science Award. She was honored at the society’s annual meeting in Orlando, FL. Dr. Williams receiving the 2015 Equine Science award on Monday night, presented by Connie Larson from Zinpro Corporation, at the American Society of Animal Sciences annual meeting. Dr. Williams’ primary appointment is Extension/Outreach, where she provides statewide leadership in three main areas: equine nutrition, pasture management and overall horse management. Creating programs that have focused on pasture management for horse farms and creating best management practices leading to healthier animals and a more sustainable environment, these project areas have drawn industry partners including professionals, volunteers, and youth. Dr. Williams was principal investigator on a successful grant titled “Sustainable Pasture Management for Horses”, the first to be awarded to an equine project from the Northeast Sustainable Agriculture Research and Extension (NE-SARE) a program of USDA CSREES. The program emphasis led to improved pasture quality and water-soil conditions on horse farms meeting the mission of the SARE organization for sustainable projects. Following the research completed for this grant, Williams became the team leader for a large multidisciplinary project titled “Creation of an Environmental Best Management Practices Showcase at the Equine Science Center”. The team addressed environmental issues of importance to New Jersey’s horse industry stakeholders, creating a state of the art equine Best Management Practice (BMP) showcase at the Equine Science Center’s facility on the Ryders Lane Farm at Rutgers University. Her other research focus lies in the field of equine nutrition and exercise physiology, specifically antioxidant supplementation for equine athletes and how various products can help decrease the stress and inflammation resulting from exercise. The results of Dr. William’s antioxidant work has been recognized nationally and internationally in the nutrition and veterinary fields reflected by the number of invitations she has received to lecture on the topic. Dr. Williams is an alumna of Colorado State University, where she earned her Bachelor’s degree in Equine Science, and of Virginia Polytechnic Institute and State University where she earned a Master’s degree in Animal and Poultry Sciences and a Doctorate in Animal and Poultry Sciences. She joined Rutgers University in 2003. The ASAS-ESS Equine Science Award is given to recognize outstanding achievement in the areas of extension, research, teaching or agribusiness in the equine industry. The American Society of Animal Science is a professional organization that serves more than 5,000 animal scientists and producers around the world. For additional information, go to asas.org.